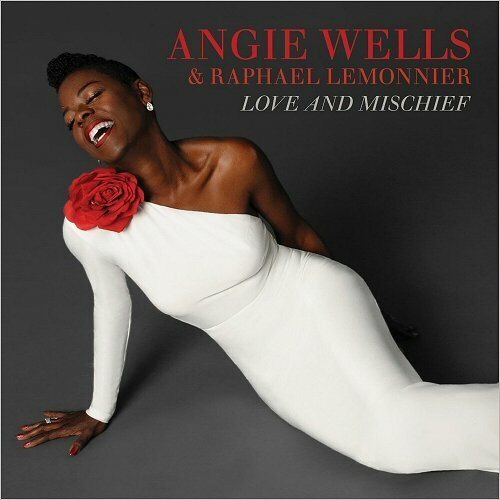 Angie Wells is a wonderful American jazz vocalist, who recently has released her first album, Love and Mischief. We found each other on Facebook last August, and met for the first time in Paris May 17. 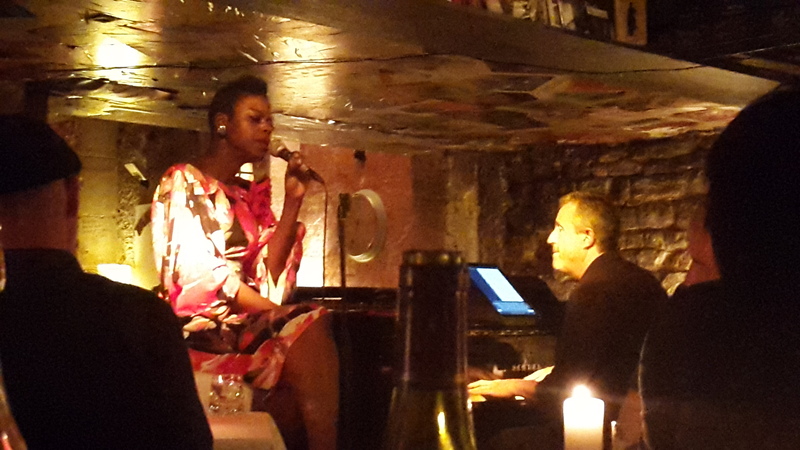 My wife and I came to Paris to enjoy and cover another artist (which we did), but during the planning of the trip I learned that Angie was going to perform at Chez Papa Jazz Club & Restaurant on our arriving day. We changed our hotel booking to a hotel nearby, and managed to arrive at the restaurant a few minutes into Angie’s first set. Walking into Chez Papa we see her sitting on a bar stool by the grand piano in a stunning red dress, enjoying the piano solo of the song. She pays attention to what happens in the place, and when we pass by she recognises me from Facebook and waves happily to us. And in between songs she later introduces us to the other guests in the restaurant. This is a kind of reception I am not used to, and I suspect few are! Angie’s first album has received some very good reviews, and you can find some of them on Angie’s web site. Her alto voice and singing style is praised, and critics say that this is a very promising debut. I cannot but agree. For me, I especially like the two original songs of the album – the ballad The Moon Is Swinging on a Line by Raphael Lemonnier, Mathis Haug and Angie Wells, and the blues She Ain’t the Kinda girl by Wells and Lemonnier. We have listened to the album a number of times at home, and now we are here to listen to Angie live for the first time – today together with the French pianist Philippe Duchemin, who during the night proves to be a very good match with Angie’s voice and expression. Angie does not disappoint us. On the contrary, what is said in the reviews about her singing on the album does show even more at this live performance. And a live performance also lets her add pleasant small talk and a beautiful outfit to her singing. Angie takes it seriously to be an entertainer, with a platform in jazz. She is a lady who combines hard work with a happy flavour of glamour. In the break between the two first sets Angie comes to our table to talk to us, but not only to us. During the two breaks during the night I believe she tries to cover every table in the place and she talks to almost everyone. She does not actually take a break herself from the beginning of the first set to the end of the third and last set. She performs or talks to people. This little story tells a lot about Angie and her personality. She likes people. Of course you can say that making contacts and talking to people is part of her work, but every artist doesn’t see it like that. And you can see that socializing comes natural to Angie. In spite of the stunning dress, Angie is not a diva. We have a nice meal and of course we stay through all three sets. Angie singing ballads, swing and blues accompanied by Philippe Duchemin is a real treat. In a year or two we might not be able to enjoy Angie’s music in this kind of small places any longer, so we are happy we were in time to do that. Before we leave the club for the night we decide with Angie to meet for coffee and a talk next morning. And so we do. During a long coffee session we learn a lot about Angie. When I in the end of our conversation ask Angie what she particularly would like to see in the text I am going to write, she points out her varied background. She does not point out that she is outstanding in this or that – it is the varied background she wants to highlight. And she really has a varied background. Angie comes from Philadelphia where she in high school took a major in science. In college she continued with science for two years, and then took a business degree. During college Angie was working as a corporate trainer, but shortly after graduation the company downsized and she lost her job. Angie’s father had a barber shop, and maybe that is one reason why she is also interested in makeup. She went to cosmetology school and became a hairdresser, and worked as such in Philadelphia for some years. Eventually she moved to Los Angeles and attended a makeup school to become a professional makeup artist. Then she started to work as a makeup artist in Hollywood. During this time Angie visited a friend in Paris (2006), and one night they went to Chez Papa. The friend told the people in the restaurant that Angie was an American jazz vocalist, and that she could sing with the band that played there that night. Well, Angie liked singing but she was not the established vocalist that her friend’s recommendation implied. But Angie was offered to sing a song, which became three songs, and her performance was appreciated. But that was that, and the next week she went home. Well at home she wanted to give singing a chance and started to take singing lessons. Those were interrupted for a short while when she had her baby. When her son was six months old Angie made a demo with Bill Cunliffe on piano, Tom Warrington on base and Joe LaBarbera on drums – three established musicians. The songs were When Sunny Gets Blue, The Man I Love and Too Close for Comfort. She distributed the demo and clubs started to book her. And now we are at present time. Angie has released her first album on her own label, and she tours in France with French musicians. The appreciation she received at her unplanned debut at Chez Papa is spreading in France. So she comes here once in a while to sing. And she of course also sings at clubs in the US. It will be interesting to follow Angie in the years to come. If my prophecy will come true she might at one point have to reconsider her combination of careers. But if that happens I am sure that Angie with her drive and creativity will find a new interesting way to combine her interests. I will certainly follow what happens with great interest! So far there are only a few videos with Angie Wells on YouTube, but you can listen to Love and Mischief on Spotify and other streaming services. Or you can, of course, buy the album.